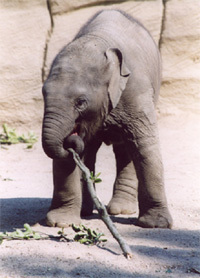 Since 2003 the First European Elephant Management School takes place at Tierpark Hagenbeck in Hamburg, Germany and will be held on an annual base. This 9 day course results out of the idea of Elephant Business and Hagenbeck´s Tierpark. Its goal is to teach husbandry, medical care and training techniques on Free Contact & Protected Contact elephants and also to be able to exchange experiences among professional elephant people from all over the world. It combines theoretical lessons with the unique opportunity to gain practical hands-on-experience on the elephants.